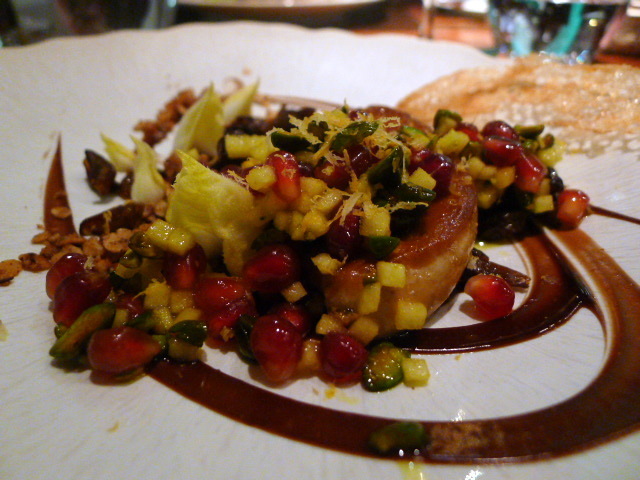 L’Autre Pied is the little sister restaurant to Pied à Terre on Charlotte Street. Opening in 2007 under Marcus Eaves, it went on to win critical acclaim as well as a Michelin star in 2009. When Shane Osborne left Pied à Terre last year, Marcus took over the head chef spot at Pied à Terre. 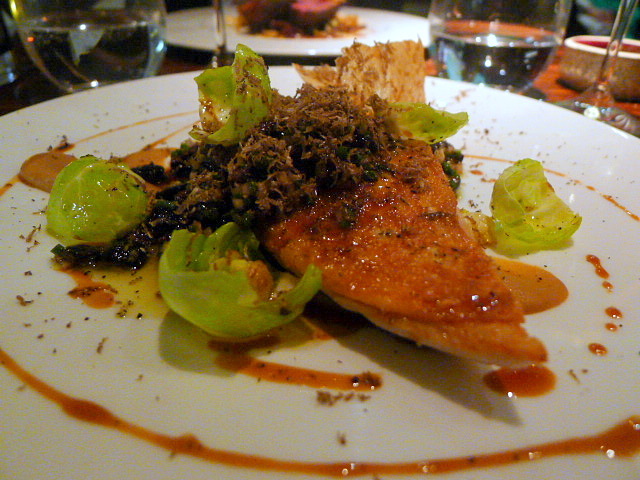 I adored the food at L’Autre Pied when Eaves was there, having eaten there on several occasions. His cooking was top notch, and the pricing was very reasonable for the standard of his cooking. His one-Michelin star was well deserved. But his departure has paved the way for some new blood. Enter Andy McFadden who previously worked at three-Michelin-starred Oud Sluis in the Netherlands and under Osborne at Pied à Terre for four years. A new head chef may mean a new approach, but the restaurant has managed to hold onto the contemporary and relaxed style that has always made L’Autre Pied one of the most accessible fine-dining establishments in London. We kicked off with an amuse bouche of pumpkin and ginger mousse which was wonderfully light and tasty. 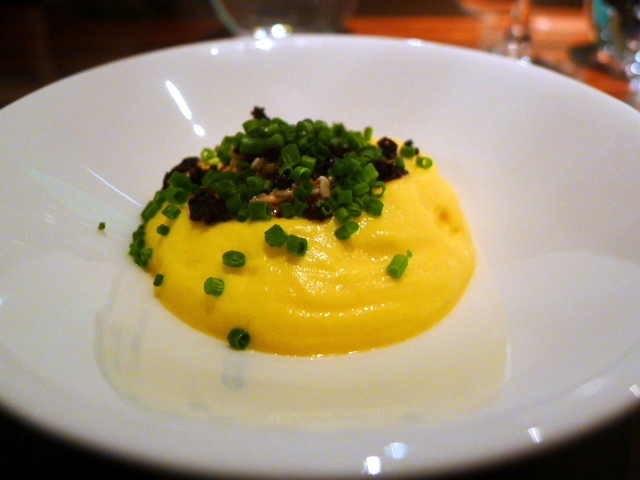 But the topping of black olive, sesame seeds and chives was probably a little heavy against the delicacy of the mousse. A starter of roast foie gras (£12.95) was unctuous, decadent and rich. It came with some lovely crispy muesli which gave the dish a delightful crunch. Semi-dried grapes, apple, and pomegranate also worked wonderfully with the foie gras, But the result of all these accompaniments resulted in a busy looking dish which ended up hiding the foie gras. A reduction of vino cotto was a touch sharp. 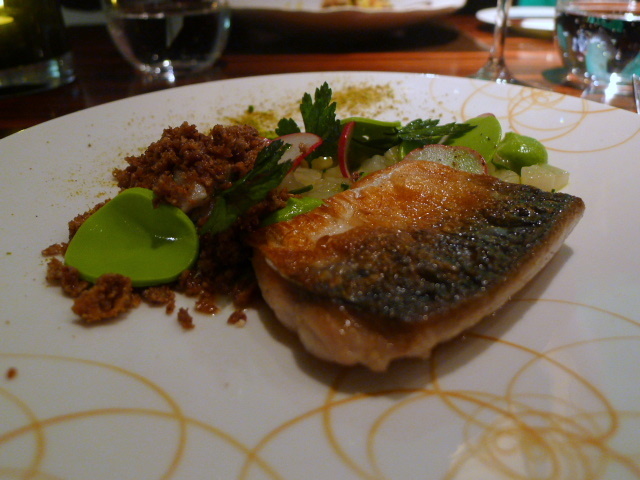 Grilled Cornish mackerel (£10.50) was beautifully cooked. It’s accompaniments of hand of Buddha (a citrus fruit), fennel and ginger purée worked well with the fish. Pan-fried scallops (compliments of the kitchen) with Roscoff onions, toasted hazelnuts and a Jerusalem artichoke veloute was to-die-for (the version on the menu comes with roasted pork belly and is priced at £14.50). 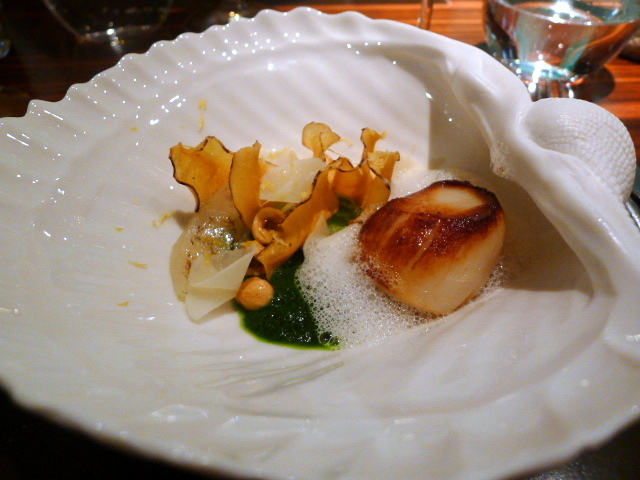 The scallop, cooked to a translucent softness, was luscious and beautiful. The crunchiness of the hazelnuts provided a fantastic textural contrast, and the flavoursome velouté completed this fantastic dish. 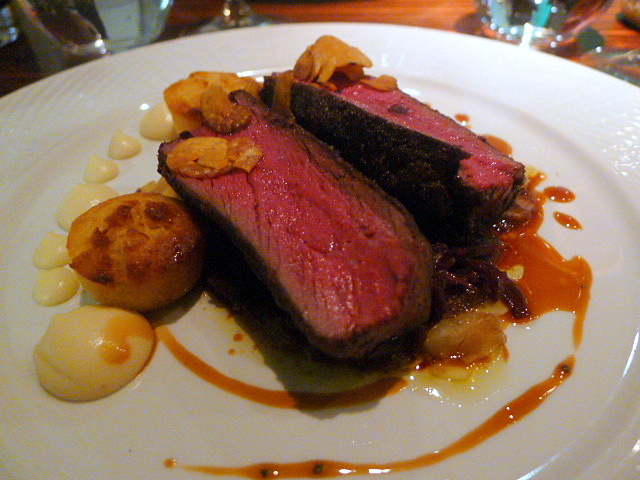 Saddle of Sika deer (£27.50) in cocoa was perfectly cooked, tasty and meltingly tender. The cocoa was well placed against the meat and not overpowering. A parsley root cake, red cabbage, shaved chestnuts and a rosemary sauce rounded off this hearty, rustic and very satisfying dish. Roasted breast of guinea fowl (£24.50) was very nicely cooked and succulent. A caramelised apple purée added a nice hint of sweetness, and a thyme jus worked well with the guinea fowl. But the use of black olives was a touch sharp against the flavour of the bird. Tea marinated prunes, golden raisin puree, cinnamon financiers, tonka bean ice cream (£7.50) provided a wonderful combination of flavours. 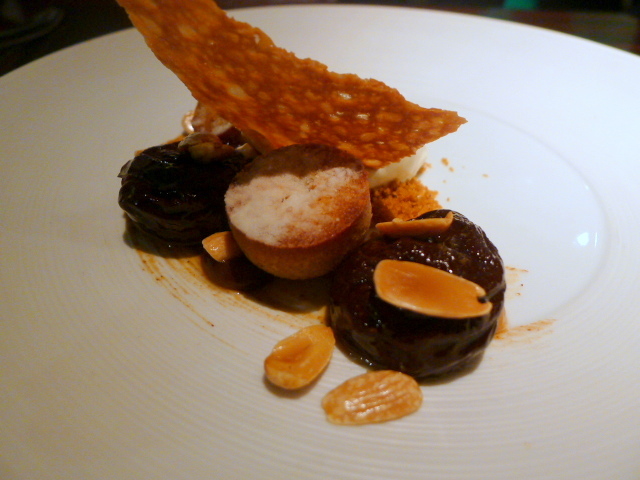 The prunes were delicious, the financiers buttery, and there was a lovely aroma in the ice cream. 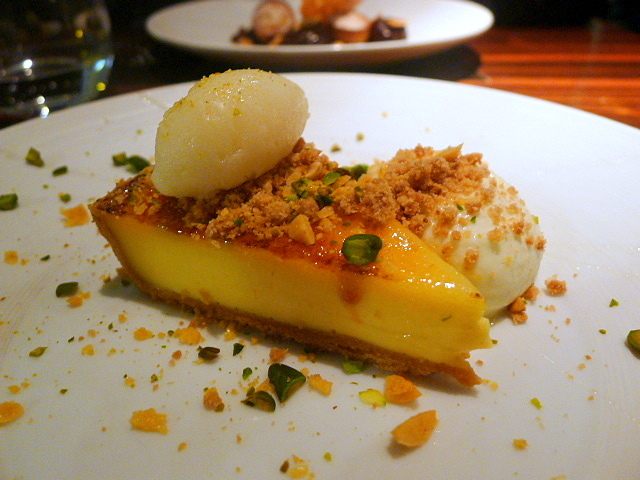 The custard in a glazed custard tart (£7.50) was splendid with a delightfully creamy texture. The pastry was a touch soft, but the accompanying honeycomb, apple foam and pear sorbet were superb. In keeping with the philosophy of the restaurant, the service was good in a relaxed and casual sort of way. McFadden’s food was gutsy, bold and accomplished, and his scallop dish won my heart. There were lots of lovely textural contrasts running through his dishes, and his technique was well judged. Some of his plating led to results which were a little busy, but all in all, McFadden has done a nice job of filling Marcus Eaves’ shoes. Price range: £39 – £50 for three courses. The nine course tasting menu is £67.50. Excludes drinks and service.